Have I told you that other than sewing, I also like to cook? Oh yes I do. As much as I enjoy eating out at a restaurant, trying out new recipe and cooking at home can be as joyful. Especially, every time I see my family enjoying the food I cook for them. Most of the time, after I try certain food at a restaurant and I like it or my husband like or my kids like it, the next few day I am experimenting the same food on my own. I Google similar recipes, added a few thing and create one of my own. I have so much fun doing that. A few weeks ago, my girl friends and I had brunch at a restaurant in West Hollywood called Blu Jam Cafe. 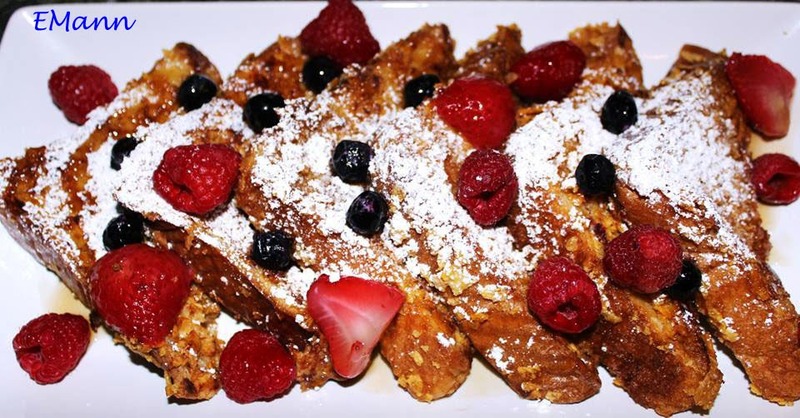 They have this famous crunchy French toast that I often heard people talked about. It's pretty good. So what I did the next few days was to create the similar recipe. And here is the Crunchy French Toast by E-Mann. 1. In a large bowl, whisk to mix the eggs, milk, flour, cinnamon, nutmeg, lemon zest, salt, and vanilla until blended. Be sure there are no lumps of unmixed flour. Pour into a pie pan or shallow dish. In batches, lay the bread pieces in the egg mix. Soak about 1/2 minute on each side in the egg mixture. Be careful not to rip the bread. 2. Place the bread pieces in the cornflake crumbs. Coat both sides with the crumbs. Place it on the heated pan coated with a little butter. Let it stay on medium heat for about 3 minutes each side or until brown. 3. Top with confectioner sugar or maple syrup or pancake syrup. Yes, it is very easy. Give it a try. Your family will love IT!